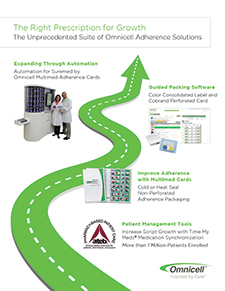 Omnicell® provides both fully and semi-automated packaging solutions to increase accuracy, reduce labor costs, and improve pharmacy workflow. Pharmacies can package medications as orders are received or pre-package medications for future need. 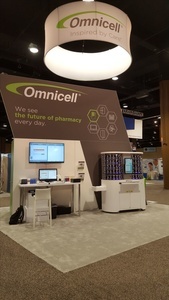 Omnicell automation improves pharmacy workflow and streamlines medication inventory management resulting in improved cash flow for the pharmacy. 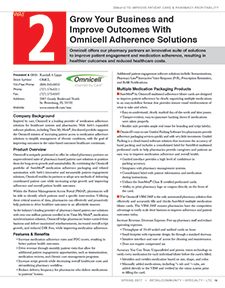 Omnicell�s family of automation products include OnDemand Accuflex® and OnDemand Express II� for single-dose blister cards, and OnDemand 400 for multiple medication blister cards. 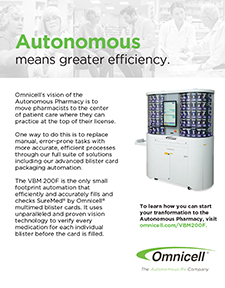 The Omnicell M5000 is the first pharmacy automation system that fully automates the fulfillment of multiple medication blister cards. 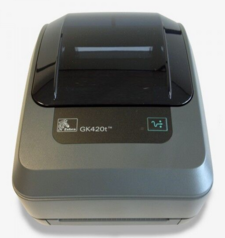 The M5000 increases productivity by generating filled, sealed, labeled, and audited cards. Omnicell automated medication and supply systems provide caregivers quick and secure access to new medication orders and emergency doses while capturing charges by NDC for accurate billing and compliance. As our industry continues to transition to patient-centric care, you need a visionary partner that understands your unique challenges and can help you meet your operational and business goals head on. Innovation is an industry-leading disruptor and a forward-thinking partner. We deliver next-generation pharmacy automation and process optimization solutions to retail, hospital, federal healthcare, central fill, and mail order pharmacies around the world. Our PharmASSIST® product suite, Pharmacy Intelligence�, customized High Volume Solutions, and value-added professional services help you optimize prescription fulfillment, reposition your pharmacists as care providers, and enhance your patients� experience. Blaze your trail today. 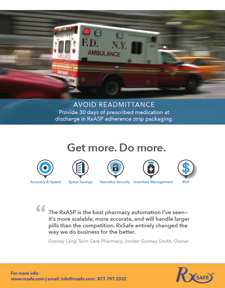 Disrupt your pharmacy operation, embrace technology, and transform your business. Scalability truly defines our products. Each product is a building block to the next. You can start with the basics with any PharmASSIST product or combination of products to address your immediate requirements. Then as your prescription volumes grow and your requirements evolve, you can leverage your existing automation and upgrade with minimal operational disruption and complete compatibility with all your existing systems. 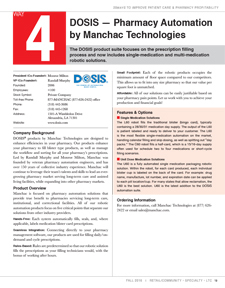 The PharmASSIST M4 dispenser is the cornerstone of all our dispensing technologies and a key component of our Pharmacy Intelligence initiatives. 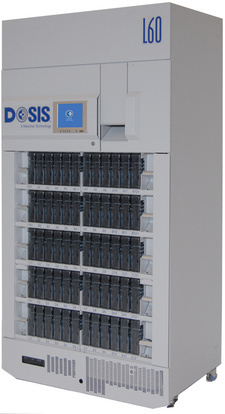 The dispenser stores, counts, and dispenses all types of tablet/capsule medications � all simultaneously � within our cabinet-based, robotic, and high volume solutions. Breakthrough Falcon Detection� technology, self calibrates the counting of new medications, enabling you to add new medications to dispensers immediately without making software-controlled or mechanical adjustments. Delivers in-depth analysis by capturing all dispenser activity in conjunction with our PharmASSIST Symphony database and providing actionable data to our Pharmacy Intelligence. 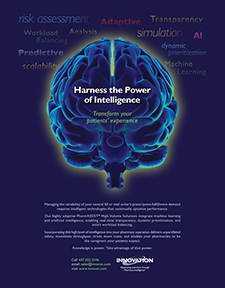 Pharmacy Intelligence is our unique combination of application-based data analytics, computer-animated process simulation, and Lean Six Sigma process analysis. Assesses operational risk, optimizes system designs and processes, and accurately forecasts results. Delivers substantiated answers before you invest in automation and helps you avoid incurring the costs of implementing and then changing a live system. Saves you invaluable time, resources, and capital, and gives you complete confidence in your system design, growth path, and automation decisions. Our Professional Services team helps you achieve your business goals by optimizing your pharmacy fulfillment-related processes. Using proven project management and development methodologies combined with unmatched workflow, operations, and technology experience, our team deepens our understanding of your pharmacy operation and provides solutions to help you achieve tangible results. Tired of paying too much for the consumables used in your automation or robot? 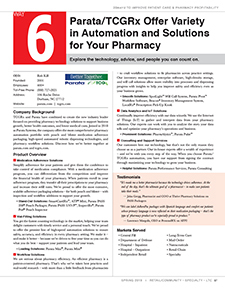 Pharmacy Automation Supplies (PAS) is your solution. 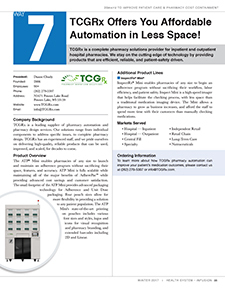 Most pharmacies aren�t aware that they have a choice of supplier for the consumables used in their automation device and as a result may be overpaying. Whether you use a vial filling robot, strip/pouch packaging machine, specialty label applicator, or have blister packaging automation PAS is proud to be one of the only manufacturers to offer 100% compatible supplies directly to the end user. 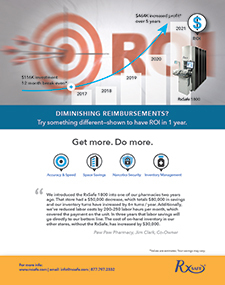 Eliminating brokers, middlemen, and other third parties who resell supplies (like the robot companies themselves) is one of the biggest things pharmacies can do to maximize their investment in automation and reduce the total cost to fill a prescription. If your pharmacy uses custom artwork on labels or any other consumables PAS has an internal state of the art graphics team that can make sure your pharmacy branding stays consistent no matter how the prescription is being filled. 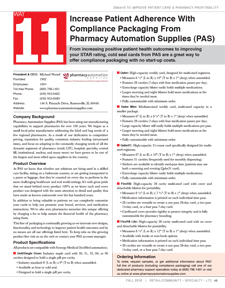 Pharmacy Automation Supplies also carries stock kits for all major automation devices that providing the flexibility of same day releases with long run pricing. 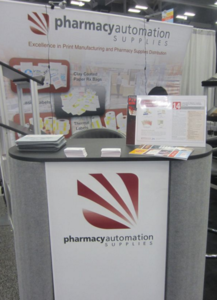 PAS recognizes that the products we manufacture are relied on to perform every day in the demanding world of pharmacy. Our reputation for quality and responsiveness to the changing needs of our customers & the industry has helped fuel our growth over the past 100 years from a small printing company to one of the most counted on suppliers in the industry. Contact one of our support specialists today to learn how our solutions can support your operations AND help save you money in an increasingly competitive marketplace! 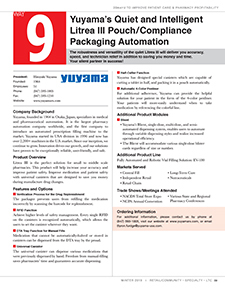 Yuyama the first company to bring automated prescription filling machine to the market. Since 1996 being established in the US marketplace we have placed more than 2,200 machines in retail pharmacies and Long-Term Care pharmacies across the country. 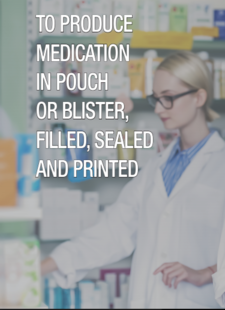 We offer several vial filling solutions for retail pharmacies as well as medication packaging options for LTC pharmacies. Our Calendar Pack Machine is a semi-automatic blister card filling and packaging automated solution for Long Term Care pharmacies. This technology was designed with the pharmacist and the clinical nurses in mind. It helps the pharmacist maintain control of the filling process and maintain inventory. The accuracy of the Calendar Pack creates a smooth workflow in the pharmacy and the clinical nursing staff by eliminating errors and by ensuring the right medication for the right patient at the right time. Our Litrea III is a fully Automated Pouch Packaging System that is designed to provide LTC pharmacies a 100% compliance packaging solution. It comes with universal canisters for ease of use with multiple drug changes. It also features half cut size canisters for half doses. Programmable logic that allow you to adjust pouch sizes for your convenience without interrupting its operation. Manchac�s DOSIS L60 is an automated 30 or 31-day blister card (a.k.a. bingo cards/punch cards) prescription fulfillment platform for pharmacies serving long term care, institutional, and correctional facilities. 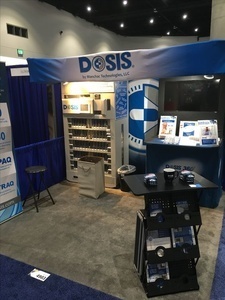 DOSIS L60 automatically fills, seals and patient labels, hands-free, both the 30 and 31-day single medication blister cards. 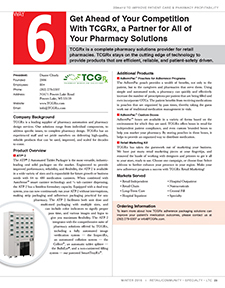 The L60 has the ability to integrate seamlessly with your pharmacy management information system and can also be used for pre-pack and for after hours unattended filling. DOSIS allows you to pre-pack and on-demand fill simultaneously. 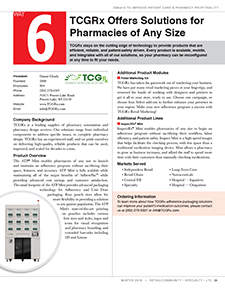 This easy to use system requires no software installation on your pharmacy computers and boasts a pharmacy friendly footprint of 26� deep x 43� wide x79� tall. 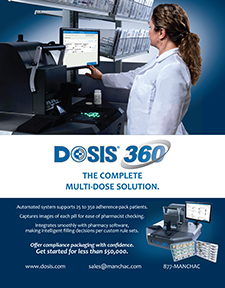 The DOSIS L60 is the first viable robot that meets all your needs; whether it is handling your high moving drugs or supplementing your filling needs for the extemporaneous drugs in your formulary. 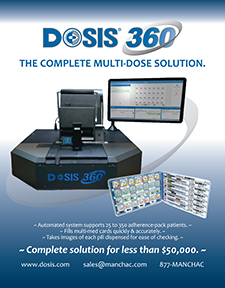 The L60�s advanced counting technology allows DOSIS to dispense directly into the blister card which enables it to dispense the quantity requested (7, 14, 28, 30 and 31), as well as eliminate cross-contamination issues. 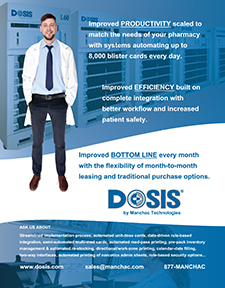 DOSIS has the ability, based on your pharmacy management information systems� capabilities, to adhere to start dates and quantities for anniversary and/or calendar date filling. Our patent-pending, revolutionary canister design gives you a universal one-size-fits-all solution, with a 1000cc drug capacity to count generics and brand name drugs with no user adjustments or calibrations. 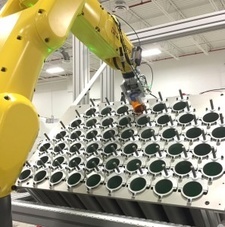 Canisters are uniquely serialized and can be hot swapped from location to location and in and out of the cabinet without any dispensing downtime. The L60 offers maximum value to you by minimizing the space required to achieve significant prescription throughput rates for all your filling needs. The DOSIS L60 is safer and more accurate allowing you to better serve your customers. 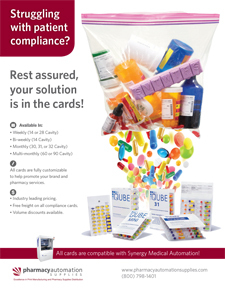 For almost 10 years, Synergy Medical has been providing proven and reliable technology for blister card automation, and we consistently meet and exceed our customer�s expectations for performance and support. 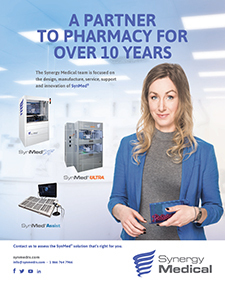 SynMed is an automated dispensing system for solid oral medications in blister packs; an automated alternative to vials and pouches, that features more than 400 dispensing containers, barcode verification processes and user-friendly software. 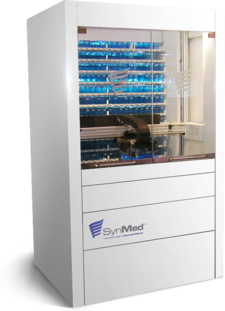 SynMed is a way to reduce costs, achieve high levels of dispensing accuracy, and a safe way to grow your business. 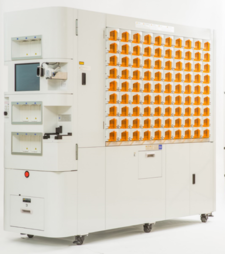 SynMed�s 400 containers contain 98% of the medications a pharmacy would dispense in blister packs, so this is a highly automated process. 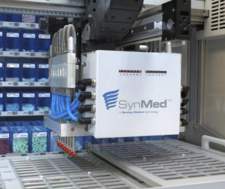 SynMed will pick and dispense 55 doses per minute; one technician can easily produce 1,000+ multi-dose blister packs over their regular weekly schedule. Technician time compared to manual production will be reduced by a factor of 5, and Pharmacist verification time will at least be reduced in half, due to the system accuracy, and proprietary verification markers on the label. 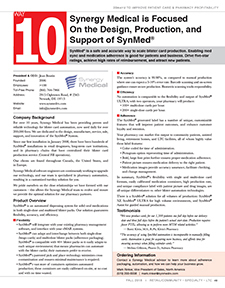 SynMed is versatile and can adapt and interchange between both single and multi-dose blister packs. SynMed is compatible with over 30 (and growing) blister packs so will easily adapt to each unique environment; that means pharmacies can automate with the blister card their patients are used to receiving. 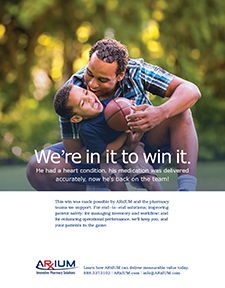 SynMed is both a Medication Synchronization and Medication Adherence strategy to drive 5 star ratings, achieve high rates of reimbursement, and attract new patients. Further, the unique SynMed generated compliance label features both patient pictures and medication images; this enables pharmacies to market this output to Community Patients, Assisted Living, Retirement Homes, and LTC facilities, all of whom highly value these label features. 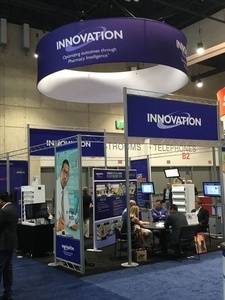 In summary, SynMed�s flexibility with single and multi-dose card formats, 400+ containers, high production rate, and unique compliance label with patient picture and drug images, are all unique differentiators vs. other blister automation technologies. 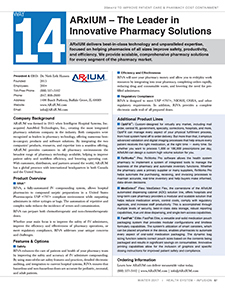 ARxIUM delivers best-in-class technology and unparalleled expertise focused on helping pharmacies of all sizes and types improve safety, productivity and efficiency. We provide comprehensive and scalable pharmacy solutions for every segment of the pharmacy market � health systems, long-term care, retail, and central fill � designed with category-leading automation hardware and workflow software, and supported by unmatched industry knowledge. Scalability, efficiency and cost control are the key values of our line of vial-filling solutions designed for community and outpatient pharmacies. Whether you are looking for a sophisticated robotic dispensing device or simply a better way to manage your fast-moving medications, our FastFill� line can accommodate any script volume. 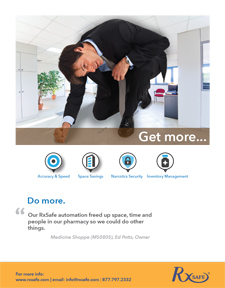 FastFill� 220 is designed for pharmacies filling 500 to 1,000+ prescriptions per day. 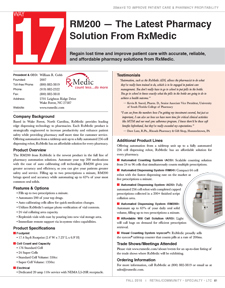 FastFill� 120 is designed for pharmacies filling 200 to 500 prescriptions per day. FastFill� 54 is a compact, expandable, smart solution that houses up to 54 oral solids and utilizes direct fill technology via dedicated chutes for each medication. 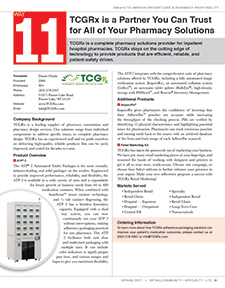 Uses the pharmacy�s available vertical height to increase the number of stock keeping units (SKUs) stored in the same footprint by up to 60 percent. 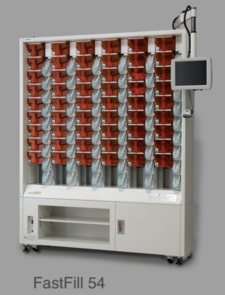 The carousel concept allows technicians to retrieve medications from a single location and the ergonomic design minimizes bending and reaching by picking from waist height. 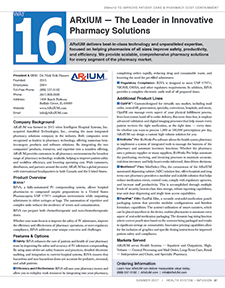 High volume solutions from ARxIUM are custom-designed for hospital, long-term care, retail and government pharmacies. Our primary high volume solution, OptiFill� is utilized by more pharmacies than any other system, processing more than 200 million prescriptions each year. The Cadet® Vantage Series Solid Unit Dose/Barcode packaging systems use thermal transfer printing to allow easy readability of text, and accurate scanning of barcodes. All major barcodes are included. 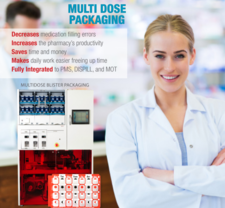 We offer four versions of solid unit dose packaging systems, with several options. The Cadet Twin® is also available with a 1.5� wide package. Numerous AccuPrint® Thermal Transfer Printers are available, including color printers, for printing barcode labels, product identification and other kinds of labels for pharmacy use. 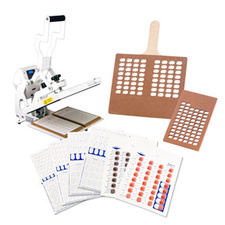 The labels can be very small labels, large labels or �Flag Labels�. The widths can be as small as 0.5� up to 8.0�. Label design software and on-site training are included. Liquid Unit Dose/Barcode packaging system uses 300 dpi thermal transfer printing. The Speedy Wet Cadet® can be used for small runs of 5 to 10 doses at a time or much larger runs of 100�s of doses at a time. The accuracy is +/- 1% with volumes from 1 ml. to 30 ml. Customers use the Vantage Speedy Wet Cadet® for non-available or non-barcoded liquid unit doses, or to save money by buying in bulk and repackaging (sometimes saving up to $1.00 per dose). Cup Size 22 ml. or 44 ml. The Cadet®, Cadet Twin®, Cadet Twin® 2x2, Punch Cadet®, and Speedy Wet Cadet® are trademarks of Euclid Spiral Paper Tube Corp.
ScriptPro designs systems with various size and configuration options that offer flexibility and maximum scalability. 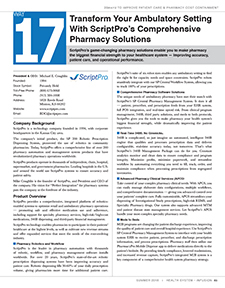 ScriptPro installed the retail pharmacy industry�s first truly hands-free robotic dispensing automation in 1997. Those first systems are still working and filling prescriptions after 15 years because ScriptPro guarantees support for 10+ years. Improvements to ScriptPro robots are retrofittable, so you won�t be stuck with an obsolete system. 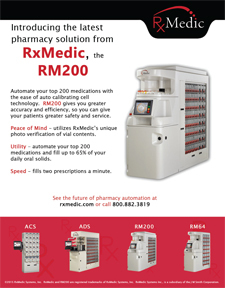 No matter what your prescription volume is, or the size of your pharmacy, we have a robotic solution for you. Lower your cost to dispense. Free your staff for other productive business. 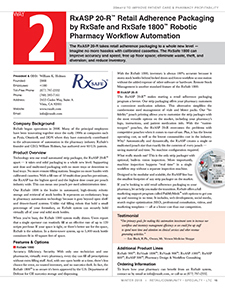 By implementing a ScriptPro Robot + SP Central Workflow System, your pharmacy will track and dispense 100% of your prescriptions with the highest level of accuracy, efficiency, and personalized service to customers. 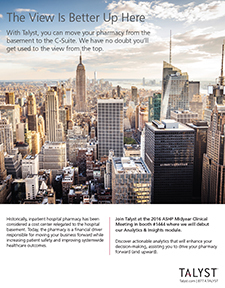 Customers ranked ScriptPro�s SP Central PMS #1 in the category of Software Solutions � Pharmacy � Outpatient (Retail) in the �2012 Best in KLAS Awards: Software & Services� report. Additional Automation Products from ScriptPro. Telepharmacy for Sterile Room Medication Preparation. 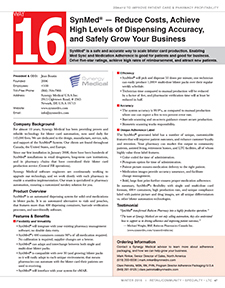 Increase accuracy, improve throughput, and save space in your facility, while reducing labor. Whether its adding strip pouch packaging equipment to your existing workflow, introducing verification to your pharmacy, or building a pharmacy from the ground up, Noritsu Medical Group offers state of the art pharmacy automation solutions. Our product offering provides for unit-dose and multi-dose packaging, labeling, and medication delivery hardware and software as well active, on-site, integration, and training. For over 35 years, Noritsu has earned long term relationships with its customers by providing customized solutions and fast, reliable, personable service. Our nationwide service team is directly employed, not contracted, with an average tenure of 14 years. We understand that every business is different, so our company culture is to provide individualized service in order to build trust and success. To us, you are not just a number; you are an important business partner that needs reliable equipment and support. 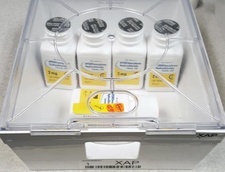 Accurate, fast, and reliable, Xana strip packagers feature a unique design engineered around efficient pharmacy workflow. Our software prompts operators to proactively address inventory allocation and changes at the most beneficial time in order keep production uninterrupted. The space saving vertical drawer design stores and secures up to 400 unique oral solid NDC cassettes and allows easy refilling and stock rotation, while the patented "Intelligent Feeder" system ensures the highest level of accuracy. You don�t have to be an engineer to appreciate the build quality of this equipment. Once you see, hear, and feel how smoothly the Xana Series operates, you�ll have confidence in its reliability. Reliable equipment means you can spend more time building your business. The MDM series of detection systems offer state of the art medication validation by patient regimented pouch and dose analysis. 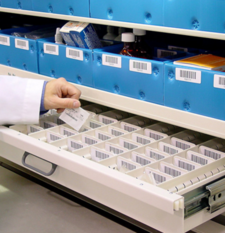 Built with durability and accuracy in mind, an MDM system can increase your workflow dramatically by quickly checking every pouch for accuracy against a library of medications. Three models available to fit the needs of any size facility or application with pouch. GSL Solutions Inc�s technologies are founded by the marriage of the minds of an engineer, Steve Garrett and a pharmacist, Shelton Louie. Both understood from the very beginning that prescriptions are physical products and needed to be tracked physically. Further, they added the requirement that the technology they developed needed to track automatically, without repetitive scanning. These requirements led them to use RFID in their will call storage (IntelliCab�) and controlled substance (IntelliVault �) systems. Just released in summer 2017, is the GSL IntelliVault� for the stock storage and prescription filling of controlled medications (C2-C5). Like IntelliCab, IntelliVault is based on real-time RFID and integrates seamlessly with IntelliCab allowing for the tracking of controlled medications from receiving through sale. Efficiency in operations is achieved through an automated C2 log, 100% user accountability and pill tracking. Because of the automation, technicians can fill C2 prescriptions freeing pharmacists to focus on skilled pharmacist work. 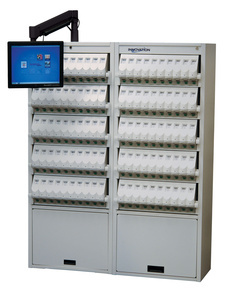 The IntelliCab� System combines standard RFID tags (affixed to our SmartBaskets) with GSL�s proprietary RFID readers, our unique lock-able electronic cabinet design, our three dimensional storage drawers, and our real time tracking software to make your will-call operation more accurate, more efficient, more professional, and much more profitable. 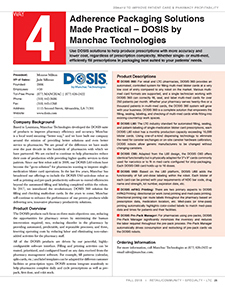 The new ATP® 2 is industry�s most comprehensive and accurate oral solid packager. 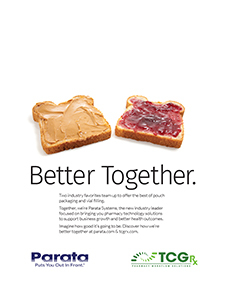 TCG�s innovative and groundbreaking software addresses market needs that have never before been addressed. ATP 2 is now expandable from 64 to 480 canisters, and with AutoSense� SmartChip technology, your canister bandwidth is unlimited. With ATP 2�s new Dual Tray system, you can continuously run without interruptions. The integrated dual tray precipitates constant pre-staging of tray medications, so there is no pausing mid-batch for a tray refill. The new ATP 2 also provides 4 pouch sizes for maximum flexibility. 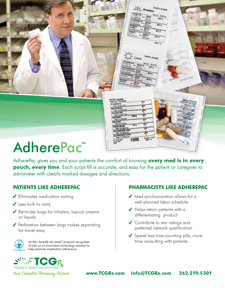 Graphic printing allows you to include more meds per pouch using the new Label manager. Reproduce labels with a touch of a button with any Windows fonts, adding logos, graphics, extended barcode options including QR code and Aztec symbologies. 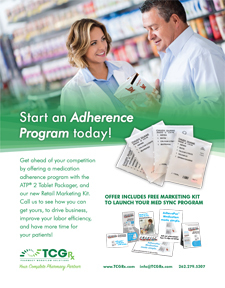 Boost business by employing the AdherePac program with your customers, ensuring medication adherence, and guaranteeing refills each month with customers enrolled in the program. Increase your ROI by suggesting the addition of vitamins for pennies on the dollar. Inspect 24 � 2,400 pouches/hr. Inspect 36 � 3,600 pouches/hr. Inspect 54 � 5,400 pouches/hr. Images are analyzed using a self-maintained database to inspect 12 characteristics of meds in each pouch. 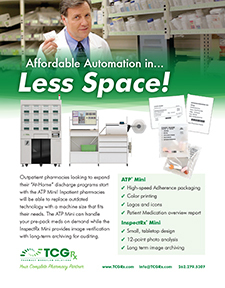 A precision-engineered, high-density storage product line that will help your pharmacy become more organized, reduce your inventory footprint, and speed up your script-filling process. 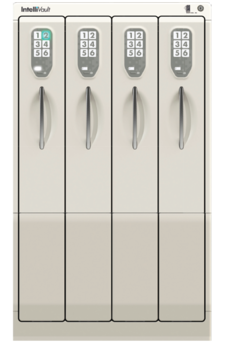 HDStock has been specifically designed to store medications, paying special attention to ergonomics and functionality. The result is a completely logical storage system that�s extraordinarily convenient to use. No other system offers you drawers that can store more items within the same space. 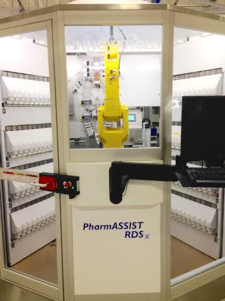 From the very beginning, we created Robotik Technology to offer a manual dose preparation solution system for pharmacies in the French marketplace. Leading the marketplace with innovation on dose preparation solutions has become our passion and our goal. In addition to the French market, we have offered solutions in Europe, Asia, and now the Americas. In 1997, more than 250 French and European pharmacies were equipped with manual �personal dose administrations� (PDAs). Building on this success, in 1999, we created our R & D department to continue to provide more in-depth solutions. We combine technological flexibility and regulatory compliance: our quality system and project methodology aim to provide state-of-the-art products and solutions. This methodology is based on an interactive approach that promotes responsiveness and collaboration with our clients. 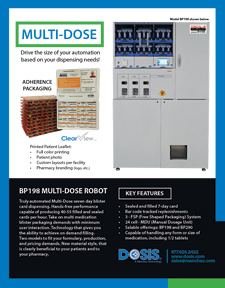 Our latest technology offering is the Blisterpack dose robot, designed to use a wide range of blister card material types. 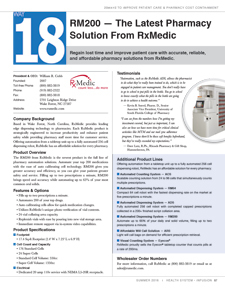 This is the first robotic blister card solution that can be configured for either Multi-Dose or Single-Dose dispensing. Combining performance, reliability, and ease of use, our PDA-Automation robot�s range is complete and tailored to meet your needs. Discover all the technical characteristics of the different models of automatic dispensing and bagging/pouching or blister card systems for oral solids. Robotik is not just a dispensing device provider. Our PDA-Automation is just the stepping stone of the solution that will enable your pharmacy to provide a higher level of patient care services centered around dose administration. 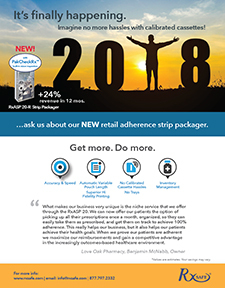 With our Eureka software products, we can tailor a complete solution so that you have a unique medication compliance system in place that better aids the retention of customers and raises their health status and satisfaction with the pharmacy PDA your pharmacy can offer. 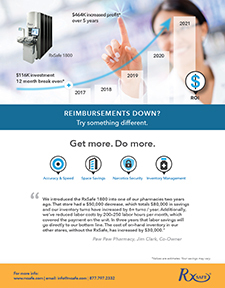 Let Robotik Technology partner with your pharmacy to build a healthy future together! Medical Packaging Inc. (MPI), a global healthcare packaging solutions provider for over 40 years, provides innovative pharmacy packaging solutions for packaging oral solid and oral liquid medication, and overwrapping and labeling of ampoules, vials and syringes, which contribute to saving patient�s lives by reducing medication errors while also increasing efficiency and automation in pharmacy packaging operations. 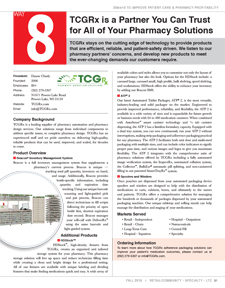 MPI�s pharmacy packaging solutions, which include the packaging system, MPI-certified consumable materials and MPI�s exclusive Pak-EDGE� UD Barcode Labeling Software, have been developed in adherence to industry specifications and meet the requirements of governing regulatory bodies for the repackaging of medication into unit dose. Optional integration to First DataBank� drug data, imprints and images library, assists the pharmacy in reducing potential dispensing errors and increasing safety and efficiency. MPI�s solutions for packaging oral solid medication include the Auto-Print® Standard packaging system, which packages sixty (60) packages per minute (ppm), the Auto-Print® Express 90 packaging system, which packages ninety (90) packages per minute (ppm), and the Auto-Print® Punch Cut Machine, which packages forty-five (45) packages per minute (ppm) and produces unit dose packages with a punched hole in the upper half of the package specifically for use with centralized, robotic systems. 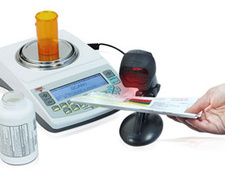 Additional functionality can be achieved through the optional Oral Solid Feeder attachment, which packages bulk medication from the bottle into individual unit dose packages, the Variable Length Option, which allows for adjustment to the package length to accommodate packaging of non-standard sized tablets or capsules, and the Barcode Verifier Option, which automatically scans each package to assure that the printed barcode can be accurately scanned at the bedside. 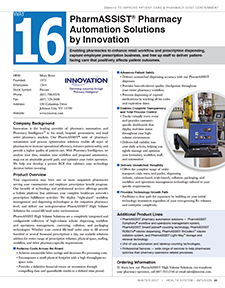 MPI�s solutions for packaging oral liquid medication include the Fluidose® Series 5h packaging system for packaging medication into unit dose cups and the Auto-Draw® Syringe Filling System for packaging medication into oral syringes. The Fluidose® Series 5h, which packages twenty-two (22) packages per minute (ppm), dependent upon fill rate and viscosity, produces a single, bar-coded, unit dose package containing liquid medication to be delivered to the bedside. Fluidose® Series 5h is compliant with The Joint Commission (TJC) regulations for dispensing oral liquid medication and is capable of dispensing volumes between 1 mL and 40mL. Additional functionality can be achieved through the Barcode Verifier Option, which automatically scans each package to assure that the printed barcode can be accurately scanned at the bedside. The Auto-Draw® Oral Syringe Filling System is a semi-automatic solution that is capable of filling most oral slip syringes up to 50 mL in volume of varying viscosities providing the solution for batch filling of syringes with speed, accuracy and repeatability. Filling operations can be completed in a manner of seconds and no additional software is required. 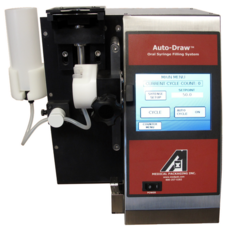 MPI�s Auto-Draw® is ideally used for oral liquid medication doses 1 mL or greater or for those medications that are not typically packaged in unit dose cups or are not commercially available in unit dose. 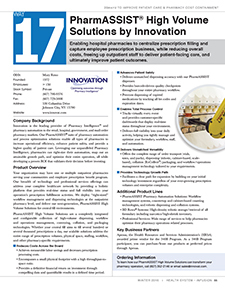 MPI�s solutions for ancillary packaging include overwrapping and labeling solutions for ampoules, vials and syringes. MPI�s overwrapping solutions include the Pharmacy Accessory Bagging System (PABS), which produces up to thirty-five (35) filled and sealed packages per minute. Labeling and barcoding is done directly on the bag, eliminating costly labels and allowing for customization of the barcode. 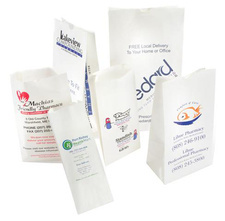 Bags are available in several different sizes to accommodate even the most irregularly sized items. 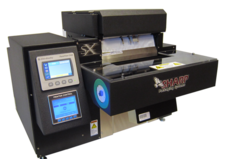 MPI�s Auto-Print® Max Bagger, packages in bags with a punched hole in the upper half of the package specifically for use with centralized, robotic systems. 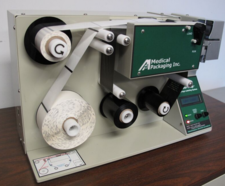 MPI�s labeling solutions include the Pharmacy Accessory Label Printer (PALP), which is offered with either direct thermal or thermal transfer technology to quickly and efficiently print accurate barcoded labels for placement on ampoules, vials and syringes. Labels are available in several different styles to accommodate all labeling needs. MPI�s Auto-Wrap® Syringe Labeling System, with labeling and wrapping speed of up to twenty (20) syringes per minute, automates the process of labeling syringes and assists in increasing production throughput while reducing repetitive stress injuries (RSI) by producing a printed label and automatically wrapping it around a syringe in one single motion. The Auto-Wrap® can accommodate any type of oral or injectable syringe from ½ mL to 60 mL without any need for adjustment or changing of parts. Open-faced design allows for easy loading of label stock and access to all controls. For more information regarding the products and services offered by Medical Packaging Inc., please visit the link provided below. 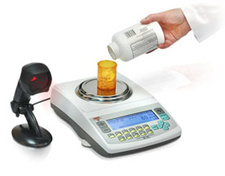 The DRX-500s Cloud is Torbal�s newest, top of the line pill counting scale. The scale mixes speed, accuracy, and an all-around ruggedness to provide a terrific return on investment in just weeks. Our pill counter connects to a Cloud Server via the internet where it transmits information back and forth during transactions. The server is preloaded with over 3,000 drug piece weights and provides access to the entire NDC drug database. 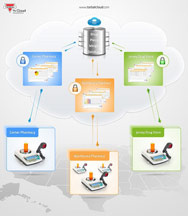 In addition, the cloud server provides its supervisors with an intuitive administrative panel to monitor all activity amongst the connected scales. The panel provides access to login permissions, transaction details, user activity, and email reporting & alerts for miscounts. The cloud server can be shared amongst all of the users, minimalizing updating responsibilities, or a private database can be configured specifically for you. The best part is the DRX-500s Cloud requires no setup, simply just plug and play! A typical pill counting transaction of 60 pills, performed on a DRX500 scale connected to the TORBAL server is made in three easy steps, and can be performed under 20 seconds. The steps are simple: tare the vial, scan the NDC located on the supply bottle, and fill the count. During each count the scale displays the name of the drug and other important drug information. APA is an advanced pill counting algorithm that quickly and efficiently adjusts for pill weight variations providing even greater accuracy when filling prescriptions. The feature is very easy to use and requires little user interaction. This system not only improves counting accuracy, it also speeds up the process significantly and eliminates the need for the pharmacist to count pills manually when updating average piece weights. The software is easily accessed and viewed with the use of a web browser such as Internet Explorer or Mozilla Firefox. 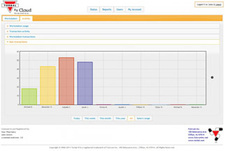 Once logged-in, the administrators have access to detailed graphs, charts, and reports, of performed transactions. The admin panel is also used to setup users and configure the server. 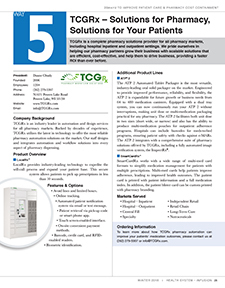 Each server offers great flexibility and can be configured to fit particular pharmacies needs and requirements. The TORBAL server generates and automatically emails daily, weekly, monthly, and quarterly reports which include details about performed counting transactions, verifications, most frequently counting drugs, as well as detailed user activity. 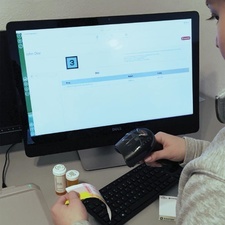 When using features such as prescription size or Rx verification, the TORBAL server monitors and records pill counting transactions to make sure that verification was performed successfully and that the count was filled accurately. If a user causes a miscount, by filling too many or not enough pills as required, or if a user fails Rx verification, the server instantly sends out an email alert to all administrators with a notification. The NDC verification feature eliminates potential errors in prescription filling. It ensures that a prescription is correctly counted and filled. The feature allows the user to compare two NDC codes and check for a match. The NDC on your Rx label barcode is compared to the stock bottle barcode. If the two scanned NDC codes are the same the scale displays "Match OK" and allows you to proceed with pill counting. If the codes are different, the scale displays a "Failed" message. Pill counting transactions which have failed Rx verification are recorded by the server in a dedicated report. As soon as "Failed" Rx verification occurs the server instantly sends out an email alert notifying the administrators. 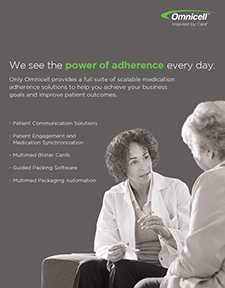 Only Omnicell provides a full suite of scalable medication adherence solutions to help you achieve your business goals and improve patient outcomes. Our goal is to see your pharmacy thrive! We do this by customizing an efficient solution to your workflow, automating large volumes of your production, and increasing your profitability in the process. Explore the technology, advice, and people you can count on. 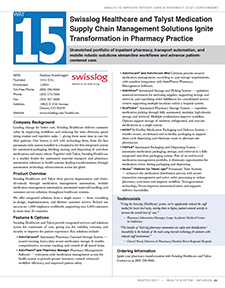 Enabling pharmacists to evolve their roles to patient care providers so they can positively affect patient outcomes. 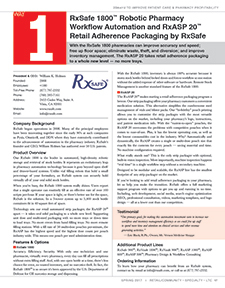 The RxASP 20-R takes retail adherence packaging to a whole new level - imagine no more hassles with calibrated cassettes. The RxSafe 1800 can improve accuracy and speed; free up floor space; eliminate waste, theft, and diversion; and reduce inventory. DOSIS solutions provide the most cost-effective and efficient methods in the pharmacy market for filling prescriptions in adherence packaging - products that reduce errors and lower labor costs by automating tedious manual processes. 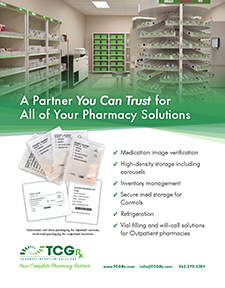 TCGRx is a complete pharmacy solutions provider for all pharmacy markets, including hospital inpatient and outpatient settings. We pride ourselves in helping our pharmacy partners grow their business with scalable solutions that are efficient, cost-effective, and help them to drive business. 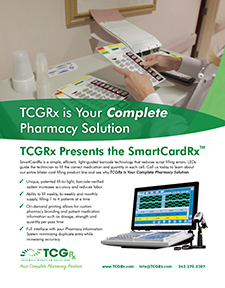 TCGRx stays on the cutting edge of technology to provide products that are efficient, reliable, and patient-safety driven. Every product is scalable, mobile, and integrates with all of our solutions, so your pharmacy can be reconfigured at any time to fit your needs. 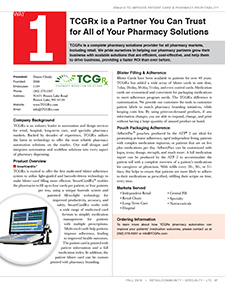 TCGRx is a complete pharmacy solutions provider for all pharmacy markets, including retail. 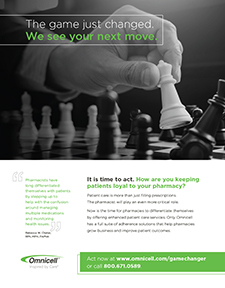 We pride ourselves in helping our pharmacy partners grow their business with scalable solutions that are efficient, cost-effective, and help them to drive business, providing a faster ROI than ever before. 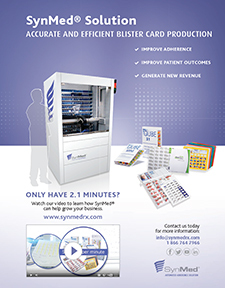 SynMed ® is a safe and accurate way to scale blister card production. 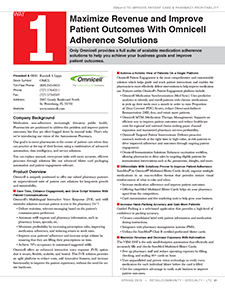 Enabling med sync and medication adherence is good for patients and business. Drive five-star ratings, achieve high rates of reimbursement, and attract new patients. Save money and maintain increased safety with the new semiautomatic flexible blister card filling system - dispensing single-dose and multi-dose blisters. 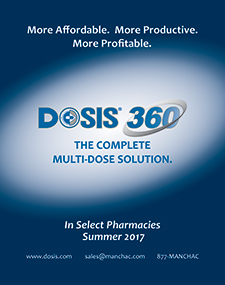 Use DOSIS solutions to help produce prescriptions with more accuracy and lower cost, regardless of prescription complexity. Whether single- or multi-med, efficiently fill prescriptions in packaging best suited to your patients' needs. 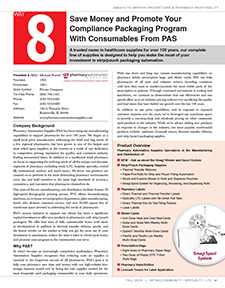 A trusted name in healthcare supplies for over 100 years, our complete line of supplies is designed to help you make the most of your investment in strip/pouch packaging automation. 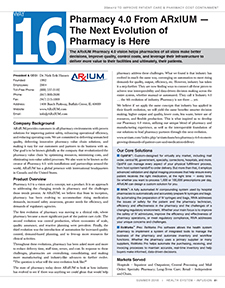 The ARxIUM Pharmacy 4.0 vision helps pharmacies of all sizes make better decisions, improve quality, control costs, and leverage their infrastructure to deliver more value to their facilities and ultimately, their patients. 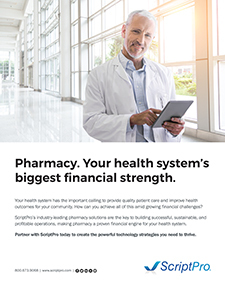 ScriptPro's game-changing pharmacy solutions enable you to make pharmacy the biggest financial strength to your healthcare system - improving accuracy, patient care, and operational performance. 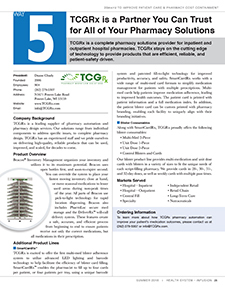 TCGRx is a complete pharmacy solutions provider for inpatient and outpatient hospital pharmacies. TCGRx stays on the cutting edge of technology to provide products that are efficient, reliable, and patient-safety driven. 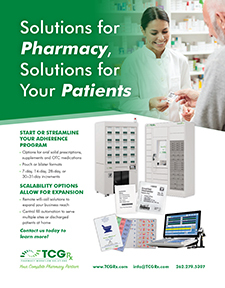 TCGRx is a complete pharmacy solutions provider for pharmacies in all markets. TCGRx stays on the cutting edge of technology to provide products that are efficient, reliable, and patient-safety driven. 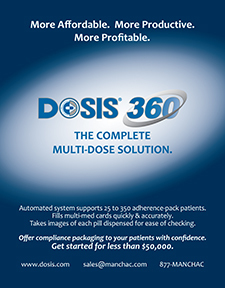 Use DOSIS solutions to provide packaging that best encourages compliance with your patients' prescribed dosing times. 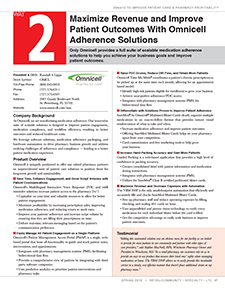 DOSIS adherence solutions are simple for your pharmacy and your patients. ARxIUM delivers best-in-class technology and unparalleled expertise, focused on helping pharmacies of all sizes improve safety, productivity, and efficiency. We provide scalable, comprehensive pharmacy solutions for every segment of the pharmacy market. 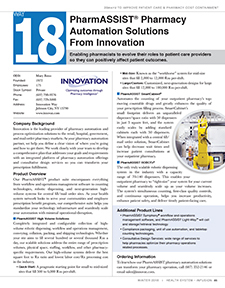 Unmatched portfolio of inpatient pharmacy, transport automation, and mobile robotic solutions streamline workflows and advance patient-centered care. 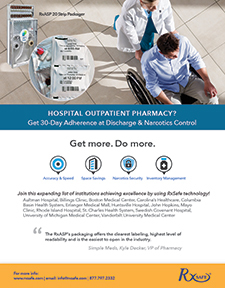 Enabling pharmacies to enhance retail workflow and prescription dispensing, capture employee prescription business, and free up staff to deliver patient-facing care that positively affects patient outcomes. Avoid readmittance! 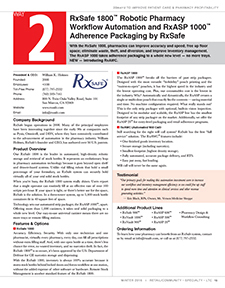 The RxASP line takes adherence packaging to a whole new level - with built-in vision inspection and no more trays. 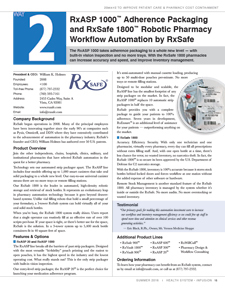 With the RxSafe 1800, pharmacies can increase accuracy and speed; free up floor space; eliminate waste, theft, and diversion; and improve inventory management. 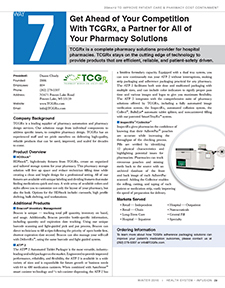 TCGRx is a complete pharmacy solutions provider for inpatient and outpatient hospital pharmacies. We stay on the cutting edge of technology by providing products that are efficient, reliable, and patient-safety driven. A trusted name in healthcare manufacturing for over 100 years our new state-of-the-art e-commerce platform is designed to help you manage inventory and be the one-stop-shop for all your consumable supplies. 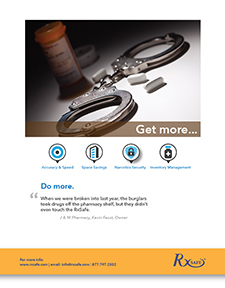 With the RxSafe 1800 pharmacies can improve accuracy and speed; free up floor space; eliminate waste, theft, and diversion; and improve inventory management. 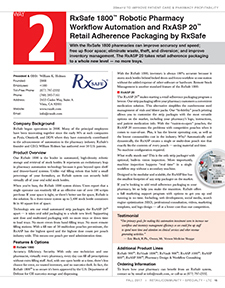 The RxASP 20 takes retail adherence packaging to a whole new level - no more trays. 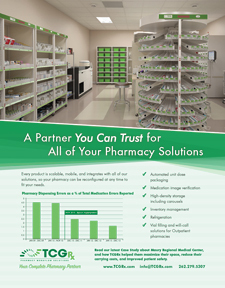 TCGRx is a complete pharmacy solutions provider for inpatient and outpatient hospital pharmacies. We value our partners' suggestions and feedback, and develop new products to meet the ever-changing demands our customers require. 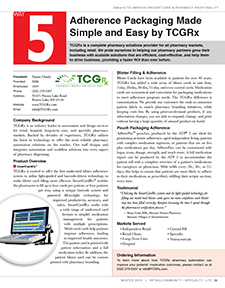 TCGRx is a complete pharmacy solutions provider for inpatient hospital pharmacies. TCGRx stays on the cutting edge of technology to provide products that are efficient, reliable, and patient-safety driven. 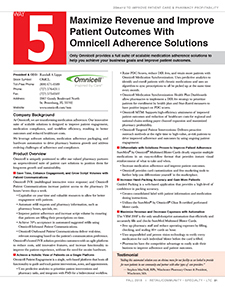 Omnicell offers our pharmacy partners an innovative suite of solutions to improve patient engagement and medication adherence, resulting in healthier outcomes and reduced healthcare costs. 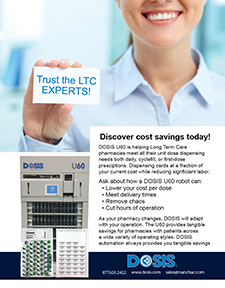 DOSIS solutions provide the most cost-effective and efficient methods in the LTC market for filling blister card prescriptions; products that reduce errors and lower labor costs by automating tedious manual processes. 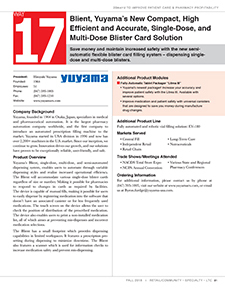 SynMed® is a safe and accurate way to scale blister card production. Enabling Med Sync and Medication Adherence is good for patients and good for business. Drive five-star ratings, achieve high rates of reimbursement, and attract new patients. AutoPharm? 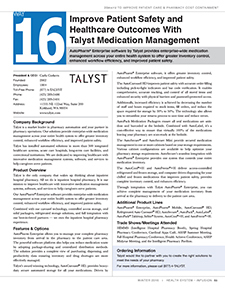 Enterprise software by Talyst provides enterprise-wide medication management across your entire health system to offer greater inventory control, enhanced workflow efficiency, and improved patient safety. 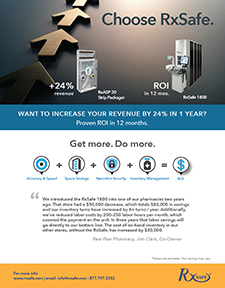 With the RxSafe 1800, pharmacies can improve accuracy and speed; free up floor space; eliminate waste, theft, and diversion; and improve inventory management. 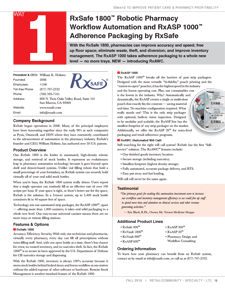 The RxASP 1000 takes adherence packaging to a whole new level - no more trays. NEW - introducing RxAWC. 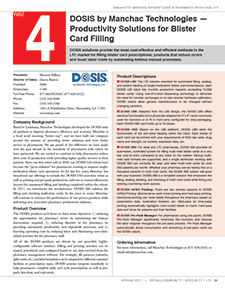 DOSIS automation provides the most cost-effective blister card automation in the LTC market; products that take the difficult hand-filling process and make it simple. 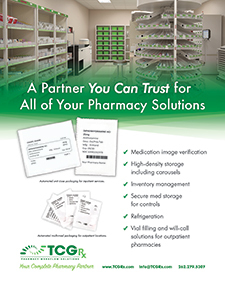 TCGRx is a complete pharmacy solutions provider for retail pharmacies. TCGRx stays on the cutting edge of technology to provide products that are efficient, reliable, and patient-safety driven. 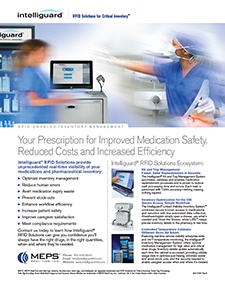 Regain lost time and improve patient care with accurate, reliable, and affordable pharmacy solutions from RxMedic. The RxASP 1000 takes adherence packaging to a whole new level - with built-in vision inspection and no more trays. 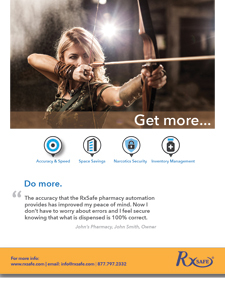 With the RxSafe 1800 pharmacies can increase accuracy and speed, and improve inventory management. 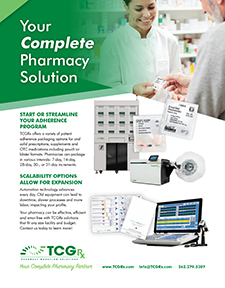 TCGRx is a leading supplier of pharmacy automation and pharmacy design services, and has something for every size pharmacy, in every market, for every budget. Our solutions range from individual components, to complete pharmacy design. DOSIS by Manchac Technologies, L.L.C. 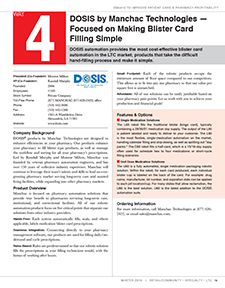 The DOSIS product suite focuses on the prescription filling process and now includes single-medication and multi-medication robotic solutions. Our solutions lower the cost and time of handling manually filled prescriptions with flexibility for growth. The RxASP 1000 takes adherence packaging to a whole new level with built-in vision inspection and no more trays. 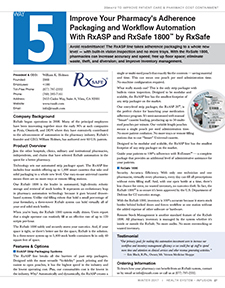 With the RxSafe 1800, pharmacies can increase accuracy, free up floor space, and eliminate waste, theft, and diversion. 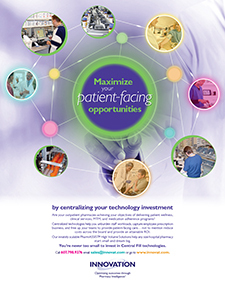 Bringing you Pharmacy Technology Solutions to Support Business Growth and Better Health Outcomes. Want to Increase Your Revenue by 24% in 1 Year? It's time to invest in your pharmacy's future. 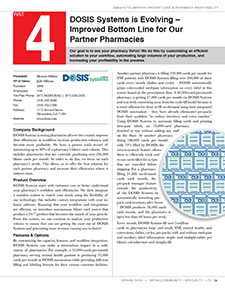 Dosis Solutions reduce disorder and waste in pharmacies. Change how you do business with automated will-call. 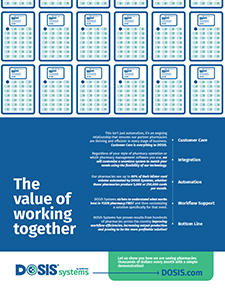 SynmMed Solution, Accurate and Efficient Blister Card Production. 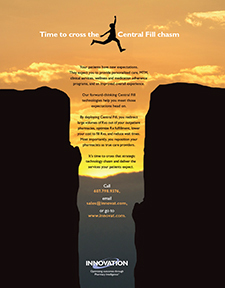 Energize - Expand your Central Fill Pharmacy. Innovative Pharmacy Solutions. We're in it to win it. ScriptPro's automated, super-intelligent 340B engine qualifies and processes prescription data to give you the confidence to tackle this complexity. With PAS' diverse family of cards, it's easy to choose the right solution for you AND your patients. Reimbursements Down? Try something different. 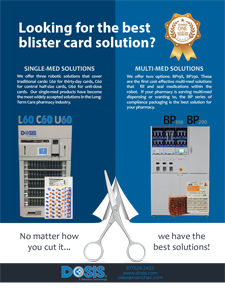 DOSIS - Looking for the best blister card solution? No matter how you cut it...we have the best! 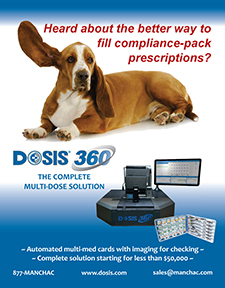 DOSIS - No matter where you line up, we have the solution! 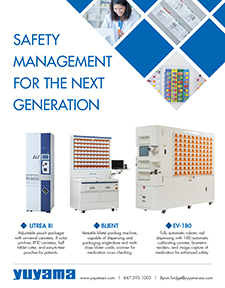 Kirby Lester, one of the world's most recognized names in pharmacy automation, is the "gold standard" of automated tablet and capsule counting systems. For more than 30 years, Kirby Lester has been delivered the most compact, affordable and accurate automated tablet/capsule counting systems, and is the only automated counting system that can address 100% of your oral solid prescriptions. 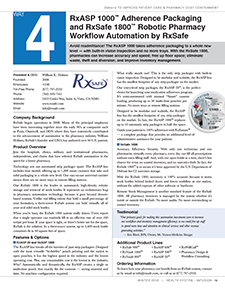 ScriptPro is committed to develop, provide, and support state-of-the-art robotics-based management and work flow systems for hospital pharmacies so they run safely, efficiently, and maximize their contribution to the healthcare system. Talyst provides an automated software platform that integrates pharmacy barcoding, storage, inventory, ordering, and clinical systems for hospitals, long-term care facilities, and correctional facilities to improve patient safety and dispensing accuracy, reduce costs, and increase productivity. 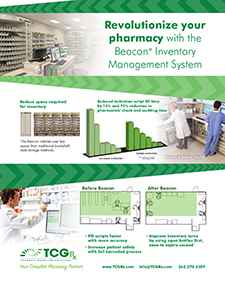 TCGRx offers pharmacy optimization across space, labor, and inventory. 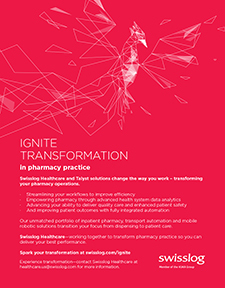 As demands on pharmacy have become increasingly more difficult to manage solutions have been offered to address the individual areas of need. 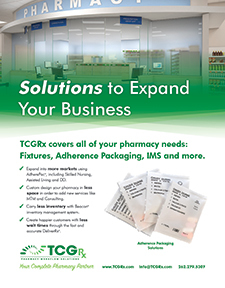 TCGRx is the only company that looks at all facets of the pharmacy to bring a total solution that addresses today's needs while leaving options open for the future. Medical Packaging Inc. was formed in the early 1970's to satisfy the need for hospital pharmacies to unit dose package and label medications. It was the first company in the United States to design and market a bench scale strip packager for hospitals. 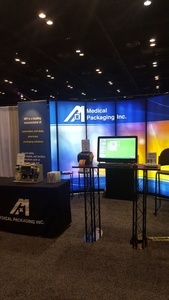 Today, Medical Packaging Inc. is an international leader of pharmacy packaging systems for both oral solids and liquids. The company's vision for the future is the ongoing development of systems and equipment to increase pharmacy productivity and patient compliance. Customer Base: Over 1600 hospitals, consulting pharmacies serving long term care, pharmaceutical research and development companies, and managed care companies worldwide. Current developments: Software package to allow patient specific labeling. Intelligent Hospital Systems (IH Systems), developer of industry-leading pharmacy automation and workflow solutions, today announced it has acquired AmerisourceBergen Technology Group (ABTG). The combined businesses will form a new company that will operate under the name ARxIUM. 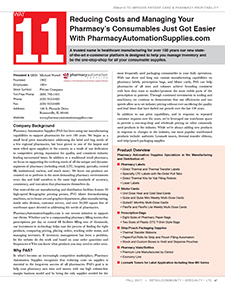 Kirby Lester, LLC, a leading pharmacy automation provider, announced that 97% of the company's KL60 and KL100 pharmacy robot users surveyed reported their device improved their pharmacy's operations. The July 2014 Kirby Lester Robotics User Satisfaction study included retail and outpatient pharmacies across the United States, Puerto Rico and Canada that were using the KL60 or KL100 robot. 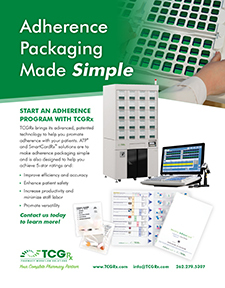 TCGRx Announces the Release of Next Generation Labeling Features for the ATP™ Series Pouch Packaging Device at the Cardinal Retail Business Conference in Washington, D.C.
TCGRx, as a leader in long term care and retail adherence packaging, has developed the most sophisticated labeling system on the market with their "Graphic Printing Kit." 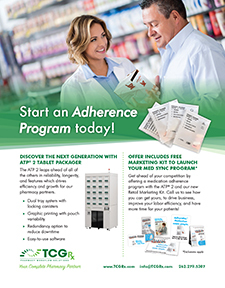 The GPK is able to be retrofitted to any existing ATP™ system in the market and will provide pharmacies with a diverse and nearly limitless variety of fonts, graphics, barcodes, and other identifiers. Since a double-count of controlled medications is required, the KL1Plus allows a pharmacy to quickly perform a second count of any tablet or capsule order. The KL1Plus stores an archived record of the second count up to 10 years. 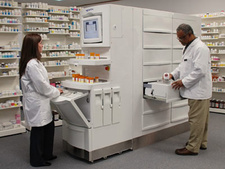 This function is ideal for any retail or outpatient pharmacy that dispenses controlled medications or expensive medications through any robot, such as the Kirby Lester KL60 or KL100. Capsa Solutions, a leading provider of medication management systems, mobile computing carts and medical cart platforms for healthcare facilities, today announced the acquisition of Kirby Lester, LLC of Lake Forest, Illinois. Kirby Lester is a leading provider of automated medication dispensing solutions in retail, institutional, hospital, and ambulatory pharmacy settings. 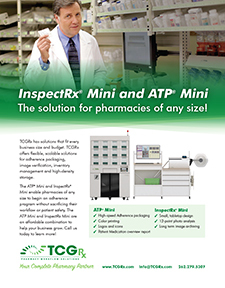 Millennium Pharmacy Systems chose TCGRx due to the technology advancements with their ATP Series and later the InspectRx machine to increase their patient safety, speed up the fill times, as well as increase the accuracy of every script filled. 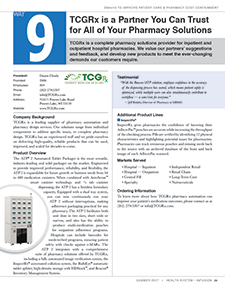 In partnership with TCGRx, PCA Pharmacy, a subsidiary of Trilogy Health Services, implemented ATP-Rx™ with SmartTrayRx™, and InspectRx™, in its Columbus, OH location in June 2013. 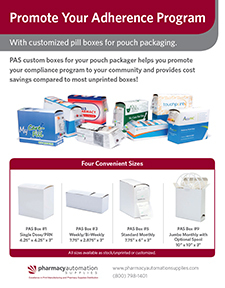 Serving long-term care customers, PCA Pharmacy now boasts improved efficiency and cost savings in its new packaging solution. Kirby Lester awarded Pharmacy Automation Contract with CARE Pharmacies Cooperative Inc.
CARE Pharmacies Cooperative, Inc. today designated Kirby Lester, LLC, as its preferred partner for pharmacy automation technology. Under the announced partnership, Kirby Lester will offer its unique pharmacy automation to CARE's member pharmacies. 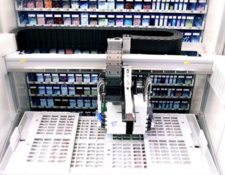 Kirby Lester, LLC, the leading pharmacy automation provider, is expanding its lineup of pharmacy automation with the new KL100 midsized dispensing robot. 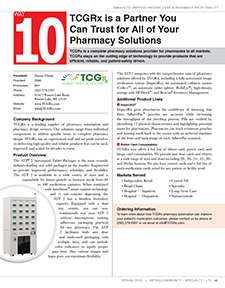 The KL100 brings a new level of efficiency and medication safety to higher volume retail/outpatient pharmacies and central fill facilities. Fifty percent or more of a pharmacy's total daily orders can be easily handled by the KL100, while the unique "FillSafe" solution allows the pharmacist to completely control the security of the refill process. 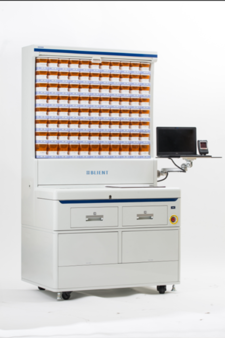 Kirby Lester, LLC, the leading pharmacy automation provider, and Tri State Distribution announced that the Kirby Lester KL60 compact robotic dispenser is the exclusive pharmacy automation for the TriMaxx® 3-sided container/closure/label system. 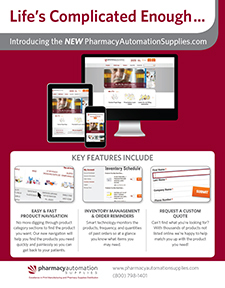 Kirby Lester, LLC, the world's leading pharmacy automation provider, announced its KL30 dispensing and verification system now simplifies a retail/outpatient pharmacy's processing of 90-day prescription filling. Omnicell, Inc. to Acquire MTS Medication Technologies, Inc.
TCGRx (TCG) Historic flooding of the Souris River divided Minot, North Dakota and forced a well-known regional pharmacy chain in the flooded Arrowhead Shopping Center to close its pharmacy serving northern Minot. 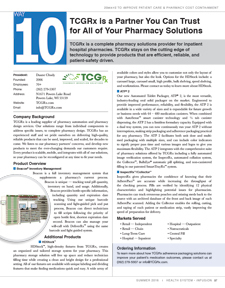 Facing a threat to patient care and revenue loss, Thrifty White Drug Pharmacy called upon TCG to rapidly deploy a turnkey pharmacy to a temporary location to aid residents cut off from access to medications by the flooding.